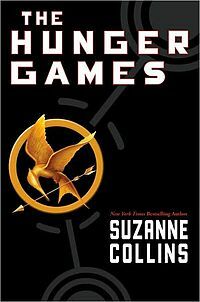 Mika, Sam, my husband, and I have all read The Hunger Games trilogy. We all loved it. I realized that the books would be perfect for literature discussion. I searched around and found a high school English teacher who uses the books with her freshman classes. She has lesson plans for the whole trilogy. I want them, really want them, but can't afford them. So, I'm going with a few projects I've been able to read about, a few free lessons I've found, and discussion questions based on the Cliff Notes available online. 1. Note the names of characters and places for future research. 2. What did Gale mean when he said they could run away if they didn't have so many kids? 3. How does Katniss' feelings for Prim affect her actions? What do you think might happen following the end of Chapter 1 given what you know of Katniss' feelings for Prim? 4. How does Katniss explain her feelings for Gale? What do you think her true feelings are? 5. How does Katniss mask her feelings for the Capitol? 6. In what ways does the Capitol keep people segregated and distrustful of each other? Between districts? Within districts? Why do they do this? 7. What is ironic about where the reaping ceremony takes place? 8. How do the people of District 12 as a whole mask their feelings for the Capitol? 9. Chapter 1 introduces several things that will be important in coming chapters. What things do we learn in this chapter that you think will be significant as the story continues? I'll be adding more questions and projects as we complete them.